In the past few years, Leonardo Pavkovic’s Moonjune Records has become a go-to resource for fans of guitarists that eschew the tired antics of traditional “guitar heroes” to focus on creative, envelope-pushing playing put at the service of the music. In the past few years, outstanding players from far-flung locales such as Indonesia have become part of the Moonjune roster – with noteworthy releases such as Tohpati Bertiga’s Riot, Ligro’s Dictionary 2 and Dewa Budjana’s Dawai in Paradise. Brazilian power trio Dialeto are the latest addition to the New York label, getting their first international release with their third album, The Last Tribe. In the two years following the release of Chromatic Freedom, the São Paulo outfit, founded in the late Eighties and led by guitarist and composer Nelson Coelho, have replaced original bassist Andrei Ivanovic with touch guitarist Jorge Pescara – a change that has influenced their sound in a rather interesting way. While Chromatic Freedom featured a few songs with vocals, on The Last Tribe Dialeto have taken a completely instrumental direction, concentrating on compositions that blend King Crimson-style angular, asymmetrical patterns with heady Latin suggestions and fiery blues licks, occasionally with a keen metal-like edge. Though some reviewers have labeled them as jazz-fusion, the latter genre is only one of the ingredients of Dialeto’s heady brew. While technical virtuosity is definitely emphasized, Dialeto’s musical offer exudes a surprising warmth and a pronounced sense of melody – which is not always the case with all-instrumental albums. The introduction of touch guitars is the key to the subtle yet noticeable change in Dialeto’s sound on The Last Tribe, adding a sense of fullness and softening the rougher edges displayed on Chromatic Freedom. The versatility of the instrument – capable of producing dry, low-down bass lines as well as reverberating, keyboard-like sound waves – complements Coelho’s scintillating guitar exertions and Miguel Angel’s all-over-the-place drumming. Though not as heavy on the ambient component as Herd of Instinct (a band with a similar configuration and approach), Dialeto’s 2013 incarnation benefits from the synergy of touch and traditional guitar, which lends an intriguingly mysterious quality to its sound. As already noticed on Chromatic Freedom, Coelho’s compositional style hinges on subtle yet recognizable variations on a theme, repeated with an almost hypnotic effect, creating a strong cohesion between The Last Tribe’s 10 tracks. Running times are kept relatively short, packing a lot of content in those few minutes without putting too much strain on the listener’s attention span. The album as a whole runs at a very restrained 47 minutes, proving once again that, in the progressive rock realm, quality does not depend on quantity. Opener “The Windmaster”sets the tone, with its clear-voiced guitar touched with a hint of Brazilian saudade; melody remains at the forefront even when the guitar turns a bit harsher and the intensity increases. Similar in conception, “Dorian Grey” also introduces a haunting atmospheric note. The album hovers between low-key, mid-paced pieces such as the ballad-like “Lydia in the Playground” and the laid-back, Spanish-tinged “Tarde Demais”, spiced up by sudden flares of electricity in the shape of dense riffing and assertive drumming, and spiky, energy-laden ones )mostly concentrated in the album’s second half), descending directly from King Crimson circa Thrak and The Power to Believe. The almost 8-minute, Brazilian-flavoured “Unimpossible”, which best illustrates the band’s modus operandi of building variations on a theme, and the exhilarating “Vintitreis” blend the soft and the hard side of Dialeto’s sound, Coelho’s guitar tone shifting from bright and sunny to razor-sharp, supported by Miguel Angel’s drum acrobatics; while “Whereisit”, “Sand Horses” and especially closing track “Chromaterius” kick the mood into high gear, with plenty of riffs and forceful drumming, the three main instruments interacting seamlessly in angular patterns only occasionally relieved by quieter moments. Finally, the steady drumbeat and brisk, dance-like pace of the short title-track convey the “tribal” element in the title. 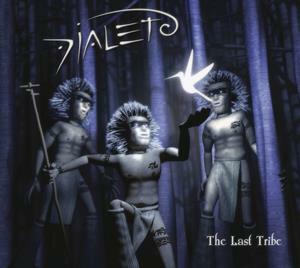 Accompanied by amusingly weird cover artwork, The Last Tribe (mixed and mastered by fellow paulista Fabio Golfetti of Violeta de Outono, who has recently joined Gong) will not fail to appeal to lovers of instrumental progressive rock, especially those who set a great store by technically proficient yet soulful guitar playing rather than lightning-fast shredding. The album, which finally sees Nelson Coelho take his rightful place among other distinguished six-stringers on the Moonjune roster, such as Barry Cleveland, Dennis Rea and Michel Delville, is also warmly recommended to fans of King Crimson and its “trio” offshoots.